The fear of technology has been the subject of countless horror and sci-fi films over the years; soon of the more notable films include the Terminator franchise which shows what could happen if machines became sentient and 2009’s Avatar, which showcase an anti-modernism and technology stance. However, in more recent years, some directors have released films are that showcasing the evil that our growing lack of privacy. 2008’s One Missed Call, and the 2004 Japanese film that it was a remake of, and 2010’s Catfish showed how bad our mass communication can be, with death and deceit being their methods. The quality of these films is not in question, seeing how the American version of One Missed Call is simply dreadful, but more the subject matter the writers and directors chose. 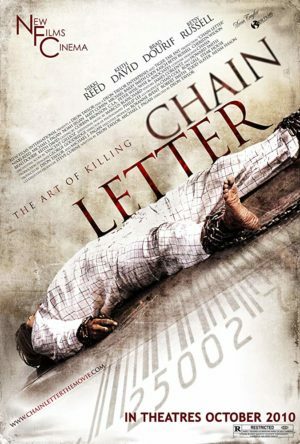 2010’s Chain Letter joined this group, as it is based on a deranged man who kills people who fail to pass on a chain letter. An Oscar-winning idea I’m sure. Chain Letter is a circular tale, starting towards the end, cycling through and then ending on the same scene. The first scene is of a young woman, chained and bound in her garage. She is chained, with one leg bound to each of her parent’s cars. As they drive away, in opposite directions, of course, they, well, you can imagine what happens. *splat* The faceless killer picks his victims through chain mail; if someone receives a letter and fails to pass it onto to five people. Of course, the killer uses chains to finish his victims. That pretty much sums up the entire film. A group of high school students, because everyone knows that high school students are best equipped to handle each and every situation where death is a possible outcome. Jessie, the main girl in the group, takes it upon herself to find out why all her friends are being brutally murdered; that one fact has plagued each of the many ‘teen horror flicks’, these teenagers who are overflowing with hormones are able to keep a cool head to do research, while their entire life is murdered. Murdered I say. The plot of Chain Letter is idiotic. A deranged veteran, who was captured by terrorists who used his cell phone to find him, is butchering people who use email to show why they shouldn’t use email. No filler. No reason for him to butcher these people. All this film does is point out how evil the internet is. Films like this shouldn’t be eligible for review in the acting department. It may not be the actor’s fault outright, but the combination of second tier actors and horrible screenwriting breeds together to waste your time. Reed, or Jessie in the film, seems almost emotionless for the entire film, except for one scene at a funeral. Of course, each stereotype is fully represented in the worst way the production staff. We have the smart girl, the slutty-hot girl, said girl’s nerdy brother, the douchebag jock, the hip guy, and the retro dude. None of these characters ever go past their surface, and none of them ever give you a reason to care when they die. It feels like the films budget went to pay for the fake blood used and to pay Keith David’s fee. Avoid Chain Letter. There really is not another way to sum this film up. The only redeeming factor is that some cheap laughs can be had for the horrorhounds among us. The film feels like a direct to DVD sequel to a B movie that flopped in theaters; a worse version of a bad thing. Chain Letter was a mistake. Chain Letter gets a D- or 1/5 Stars. It’s not good. Looking for more reviews? Check out the archives here on Horrorhut and at our sister site, SquidFlicks.com!